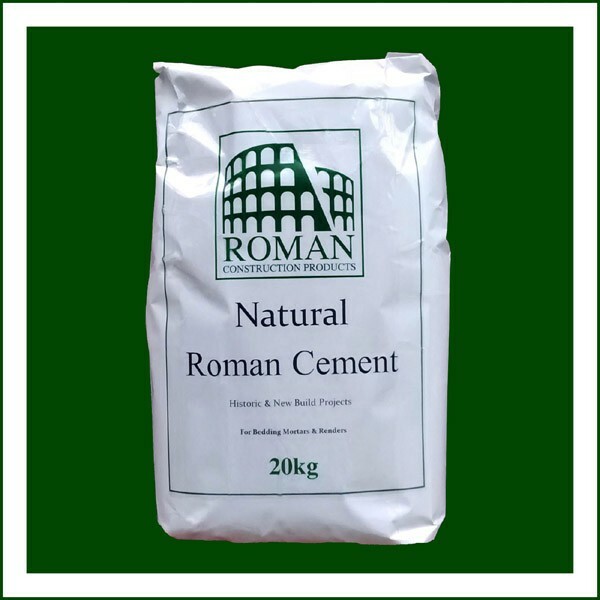 View Cart “Natural Roman Cement 64 bag PALLET (1280kg in 20kg bags)” has been added to your cart. In 1796 the Reverend James Parker Patented Roman cement which became highly desirable for its long term durability. After 1824 Roman cement declined due to the introduction of Portland cement which, in the present day, is burnt at fusion temperatures and can have some undesirable effects on historic buildings. NRC has a better compatible strength with historic masonry and renders due to the special processing of gaultstone and the lower kiln temperatures used. Please note bags are dated with manufacture date. It is known that NRC has a considerably longer shelf life than other cements. Natural Roman Cement 20kg delivered on half pallet. Description: In 1796 the Reverend James Parker Patented Roman Cement and it became highly desirable for its long term durability. After 1824 Roman cement declined due to the introduction of Portland cement which in the present day, as an Ordinary Portland Cement (OPC), is burnt at fusion temperatures and can have some undesirable effects on historic buildings. Natural Roman Cement (NRC) is now available to blend with hydrated limes for a reliable set. NRC has a better compatible strength with historic masonry and renders due to the special processing of the gault stone and the lower kiln temperatures used. NRC is suitable for conservation and new build projects where characteristics such as breathability, flexibility and colour are important. Other blends: Seek advice from Technical to check the suitability of NRC before specifying. Workable life of fresh mortar 60 minutes variable according to temperature. Store in a dry area and do not use in extremes of temperature Natural Roman Cement , NRC and Rocem (TM) are trading names of Roman Construction Products Ltd. Xi Irritant Risk Phrases R36/37/38 Irritating to eyes, respiratory system and skin R66 Repeated exposure may cause skin dryness or cracking R43 May cause sensitisation by skin contact Safety phrases S22 Do not breathe dust S26 In case of contact with eyes, rinse immediately with plenty of water and seek medical advice. S24/25 Avoid contact with skin and eyes S36 Wear suitable protective clothing Note 1: Contains salts at a rate of 6 parts per thousand Note 2: Soft cement lumps in the bag are a natural feature of this product and will not affect its performance.